The fragrance of roses, lavender, cornflowers, and flowering mint filled my car today as I ran my errands around town. It had fun delivering them to Paula and Terri so they could use them in their booth at the antique show this week-end. And I enjoyed seeing their booth! It featured the best of their shop and was filled with so many beautiful vintage things. 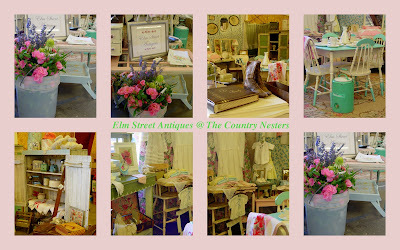 The soft pastel colors, old linens, and vintage and antique treasures all worked together in soothing harmony. I wish them much success as they enjoy visiting with community members enjoying the antique show this week-end. Happy times, you two! What a beautiful display! I hope they have much success! How fun! Beautiful pictures, and flowers! Your flowers are beautiful. That turquoise and yellow table and chairs would look perfect in my kitchen. We have an "Our Family" album just exactly like that one in the picture. Marilyn, the kitchen table and chairs would look darling in your newly remodeled kitchen! Clarice, you would absolutely love Paula's and Terri's shop! Patty, Ellen, and Susan --- their booth is beautiful, isn't it! What a lovely combination. I have been here visiting your blog "in person" even though I read it elsewhere often. After all this time your blog is still one of my favorites. What a nice bouquet of fragrances. I'm trying to recall what the coneflower scent is like. Their booth looks like it had some wonderful temptations to explore.